Olivet College is well-known for its relationship-based education and family-like atmosphere. What many might not think about, however, is how those principles extend well past graduation. 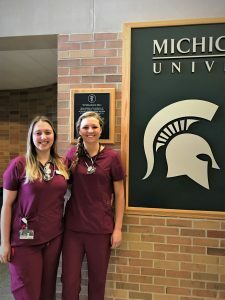 Anna Davis ’16, Dallie Flower ’18 and Kaitlyn Pirochta ’16 are continuing their Olivetian journey past the bounds of campus as they pursue veterinary degrees at the Michigan State University (MSU) College of Veterinary Medicine. Anna, a third-year student, and Dallie, a first-year student, extended their bond post-graduation, now living together in the East Lansing, Michigan, area. All three OC graduates credit their Olivet education as important to their success in MSU’s veterinary program. Anna feels that leadership is one of the most important skills she now uses in veterinary school. One leadership opportunity Anna took advantage of was becoming a founding member of Olivet’s pre-veterinary club. While a faculty member had already connected Dallie and Anna, it was here they officially met and started building a relationship. At graduate school prep sessions, they continued to bond. “Anna, having already worked through the application process for veterinary school, acted as a mentor for me,” Dallie said. “She helped format my schedule, guided me to extracurricular lectures and encouraged me to volunteer at several veterinary clinics. It wasn’t long before this mentorship turned into friendship. Anna equally values her friendship with Dallie and enjoys reminiscing with her about their Olivet experiences. “It adds to the sense of community and connectedness we all crave,” said Anna. Anna and Dallie also connected with Kaitlyn, meeting through classes and clubs and visiting their favorite hangout place — the office of Leah Knapp, D.V.M., professor of biology. Anna adds that the Olivet alumni base continues to be supportive post-graduation. Those alumni understand the same skills Anna, Dallie and Kaitlyn have carried throughout their veterinary school journeys. Dallie stresses that the focus on time management has greatly benefited her success at MSU. Anna adds that the knowledge she gained at Olivet went well past technical skills. Dallie also notes that her classes extended to a global outlook. Kaitlyn believes that her education in diversity has prepared her for a career in veterinary medicine. Relationships like Anna, Dallie and Kaitlyn’s would not be possible without their relationship-based OC education. “Olivet was instrumental because the close-knit community allowed three students separated by three different academic years to be brought together because our professors knew enough about each of us to know we would be able to help each other achieve our shared goal of attending veterinary school,” Anna said. Kaitlyn agrees that student-professor relationships are an integral part of success. The skills and life lessons from Olivet have positively influenced the veterinary education of Anna, Dallie and Kaitlyn. Their bond is strengthened by their devotion to their alma mater and passion for veterinary medicine. For more information about Olivet College, contact the Office of Admissions at 800.456.7189 or admissions@olivetcollege.edu.